Nights when I'm home alone for dinner, I get creative. Sometimes it turns out just O.K. and sometimes it turns out wonderful. This was one of those wonderful times. I love Carbonara. 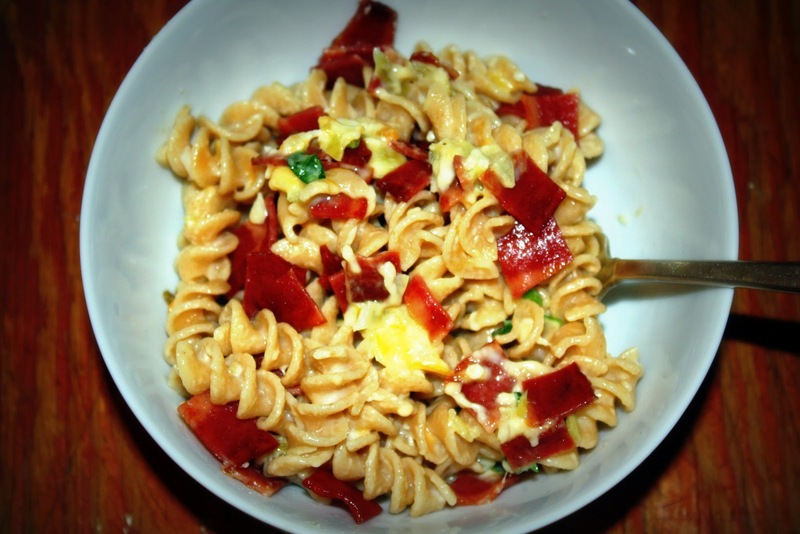 Its probably my favorite pasta dish - but its pretty high in fat / cholesterol so I never make it. But one night, just looking through the refrigerator and cupboards to find something I could make for myself with out going to the store I put together the recipe below - which turns out to be an amazing substitute. I'd say the recipe is for 2 - because I ate it for dinner and took leftovers to work for lunch the next day. But I could have eaten it all in one sitting. Cook pasta according to package. While the pasta is cooking bake the turkey bacon in the oven at 375 degrees for about 8 minutes. Let the bacon cool a bit - then chop it up into small pieces. Drain the pasta. While the pasta is draining, add the butter, garlic, green onion and red pepper flakes to the same pot you cooked the pasta in. Heat until fragrant. Add the dip and cheese and then add the pasta and stir. Turn off the heat and add the bacon pieces. Then its time to eat! This was super easy - and I'm looking forward to sharing it with my husband. See if he'll enjoy it as much as I did.